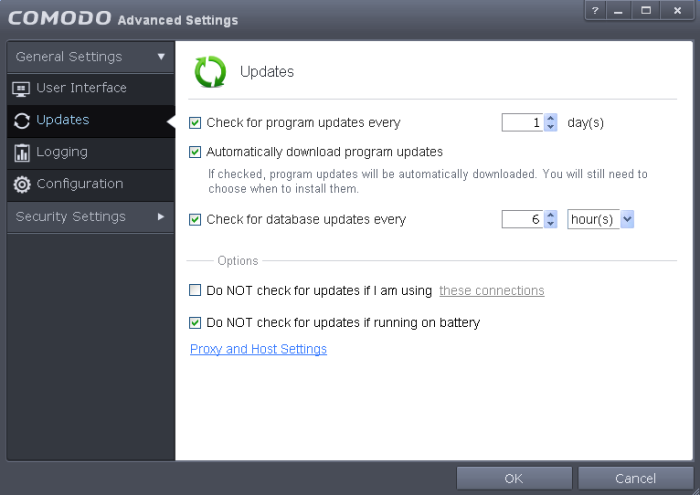 The 'Updates' area allows you to configure settings that govern CIS program and virus database updates. Then click the 'these connections'. The connections dialog will appear with the list of connections you use. Select the connection through which you do not want CIS to check for updates and click OK.
Proxy and Host Settings – Allows you to select the host from which updates are downloaded. 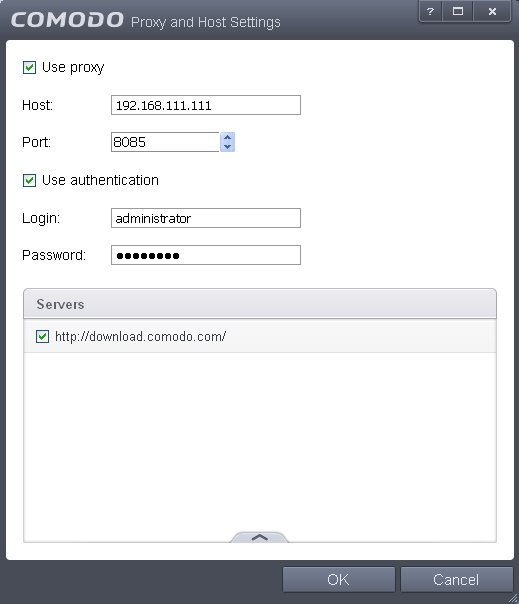 By default, CIS will directly download updates from Comodo servers. However, advanced users and network admins may wish to first download updates to a proxy/staging server and have individual CIS installations collect the updates from there. The 'Proxy and Host Settings' interface allows you to point CIS at this proxy/staging server. This helps conserve overall bandwidth consumption and accelerates the update process when large number of endpoints are involved. Click 'Proxy and Host Settings' at the bottom of the 'Updates' interface. The 'Proxy and Host Settings' interface will open. Enter the host name and port numbers. If the proxy server requires access credentials, select the 'Use Authentication' check-box and enter the login / password accordingly. You can add multiple servers from which updates are available. To do this, click the handle at the bottom center of the 'Servers' panel, click the 'Add' button then enter the host name in the 'Edit Property' dialog. Use the 'Move Up' and 'Move Down' buttons to specify the order in which each server should be consulted for updates. CIS will commence downloading from the first server that contains new updates.